One Hot Stove: IMBB 23: Viva La France! IMBB 23: Viva La France! This month's IMBB has a very exciting theme: Our host Cucina Testa Rossa challenges us to come up with some authentic regional French recipes for this one! I started with visions of making a Nicoise feast with Pan Bagnat and Aioli with vegetables, but life intervened and brought me a busy week, so here I am returning to my favorite French vegetarian stand-by: Crepes. Simple thin pancakes that are a very basic recipe, but oh-so-versatile: they can be filled with savory fillings (think veggies and cheese) or sweet ones (nutella or fruit) and can be featured at all meals from brunch to a luxurious after-dinner dessert. It is certainly a recipe worth including in one's repertoire! 1. I am particularly obsessed with the combination of spinach and mushrooms; sauteed together in some butter and garlic, I think spinach smells better than Chanel #5. See examples here and here. 2. A couple of years ago, I was visiting friends in Chicago and they took them to a cute little creperie for brunch. This delicious creamy spinach-mushroom filling was the one I chose that day and it was just perfect for a lazy Saturday morning....this is the attempt to recreate the dish. 3. Last weekend I checked out a great little cookbook from the library: Julia's Kitchen Wisdom. What a gem of a book! It contains all sorts of master recipes for basic French cooking, including one for crepes and its many variations (one spinach-mushroom combo too) and for various classic french desserts. This post is dedicated to Julia! In a small saucepan, heat the butter. Whisk in the flour and cook for a couple of minutes on medium heat, the flour should stay golden. Whisk in hot milk, then cook the sauce for 2 minutes, stirring continuously while sauce thickens. Season with nutmeg, salt and pepper. 1. Saute onions and garlic in the butter. 2. Add the spinach and mushrooms and cook till spinach wilts and mushrooms cook through. 4. Cool the vegetables slightly, then stir in the cheese and bechamel sauce. 1. Blend all the ingredients together to make a smooth batter. 2. Let the batter rest in the fridge for at least 30 minutes. 3. Heat a non-stick pan and grease it with some butter (I like to simply rub on a piece of cold butter so that it melts into a thin layer on the pan). 4. Make crepes using a small ladleful of batter for every crepe. Ladle on the batter, tilt the pan to spread it, then cook till golden-brown on one side, flip over and cook briefly on the other side. 5. Stuff each crepe with 2 tablespoons of the vegetable sauce. Serve hot. The crepes were golden and beautiful, not to mention melt-in-the-mouth delicious! This recipe is so easy and calls for simple ingredients; I know I will be making it again and again. Thanks, Cucina Testa Rossa, for inspiring me to make this wonderful French brunch! Crepes Epinard et Champignon avec Sauce Bechamel! :-) C'est magnifique! Merci beaucoup Nupur! In spite of the fact that I have this hang-up with mushrooms, your crepes look wonderful! Lacy French crepes in a cosy cafe near Champs Elysees and a mean gateau to end the brunch. Ahh, c'est la vie! PS - I see you are reading Maximum City! Do you like it? Nupur, you write so well. I mean, such good language, such flow of text and such a good presentation! Good recipes, good photographs is one thing and good verbalisation of thoughts & ideas is quite another. I hope I get to meet you personally some day. As for the crepes, I have practically lived on them (and only Nutella filling please:) in Paris. I love making them too and this veggie filling is something that I surely want to try out. Will let you know once I do. Love crepes and fillings and yours look yummie! Such a good looking crepe..
Laura, I have been wanting to make these for sooo long and you finally gave me a reason to do it! Ashwini, mmm..nice memories there! About maximum city, I like it...it is interesting...but I can't say I love it. It lacks "heart" (my perception of course). Vaishali, you are TOO generous with your words!! You have an open invitation to come visit me anytime! Hi Bea and Gini, thanks!! Thanks for your wonderful recipes! Sonia, I was on my thesis-writing break when you left this comment...that is why I only found it now! Sorry about that! I am so glad you enjoyed this recipe, and the carrot kheer too :) Thanks for taking the time to leave your feedback! 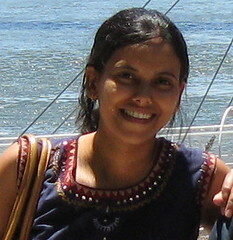 Hi Nupur, I know what I am cooking tonite thanks to you! No mushrooms at home.. but I think some sweet corn would also do well wth Bechamel sauce ..what do you think? Arati, sure thing, corn would be delicious in place of mushrooms. To tell you the truth, all kinds of vegetables would work just fine here. this was a real treat for sunday brunch, came out really gud ! with the remaining batter i tried some strawberry banana cream filling and we hogged everything ! :) thanks.. have a nice week ahead..
Abhi, Yay...I am very happy to hear that the recipe worked for you! Your strawberry banana cream filling sounds too good. Thanks for always taking the time to leave your feedback, Abhi. I sure appreciate it. Nupur - I also love the spinach & mushroom combination and was craving it this week. 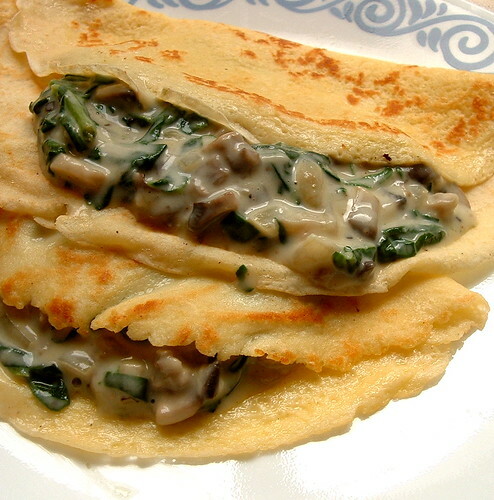 I made your spinach-and-mushroom crepes recipe tonight as-is and wouldn't change a thing -- this is a wonderful recipe! Perfect! Thanks for satisfying a craving! The spammers are out in full force so I've had to turn word verification on! Thanks for leaving a comment- I read and respond to every single one. One Hot Stove turns ONE!